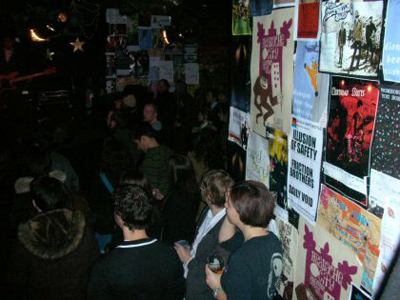 Venue Reviews #2: The Empty Bottle and The Beat Kitchen | Gapers Block Transmission The Empty Bottle and The Beat Kitchen. Whenever an old friend, acquaintance or family member asks me about my life in Chicago, I always end up talking about the same thing: the neighborhoods. I delve into their evolutions, their personality and history, their bars and restaurants and, of course, their music venues. For a guy from the suburbs of Michigan, the neighborhood music club is a novel concept and being able to see a national touring band just around the bend from my apartment fills me with a unique sense of joy. I guess I like it when the music is easily accessible. So for this installment of Transmission's Venue Reviews, I examine a few long-standing neighborhood venues in Chicago, ones that are new to this recent transplant but that are probably old friends to some of you. We begin in Ukrainian Village, on a rather desolate stretch of Western Avenue, just north of Augusta. With its nondescript but "Friendly" exterior, the Empty Bottle is just a little hole-in-the-wall, a veritable hipster's paradise that features a pool table up front, the requisite photo booth, real cheap booze, and some of the finest bands on the planet. Sporting a history too storied and rich to account for in extreme detail, the Empty Bottle has been alive and kickin' since 1992, and consistently crafts some of the most innovative lineups of musical guests, everything from, according to the website, "Anti-pop Consortium to Trans Am, in the indie-rock, electronic, experimental, jazz; post-this and pre-that." You never know what you're gonna find on a week to week, day to day basis. That's not by accident. "We try to be both inclusive and selective," says booking agent Pete Toalson. "Driven by our own interests, we work with a wide variety of genres—what we feel are the most intriguing, at any given moment—and then try to bring in the very best artists from those genres. This approach allows us to cover a lot of ground, musically, giving us the opportunity to work with disparate groups of artists that might not otherwise work within a more narrowly defined programming mandate." It's nice to know that there's a method to the madness, because anybody who's been to one or two or seventeen nights at the Empty Bottle knows that things can get out of hand in a hurry; one only need to check out the Girl Talk footage from New Year's Eve a couple moons back. There's something about the place that induces you to drink heavily (and if you've been there, you know what I mean). But the masterminds behind the Empty Bottle don't just want you to rock in their house; they created "Empty Bottle Presents" as a way to feature bands that have perhaps "outgrown the Empty Bottle or those that were looking for interesting and unique alternatives for performances in Chicago." Instead of making the trek to Ukrainian Village, fans can find Bottle performances at AV-aerie, the Congress Theater, the Lakeshore Theater, Logan Square Auditorium, Portage Theater, and Sonotheque, complete with the same low prices, killer lineups and better times that fans have come to expect. 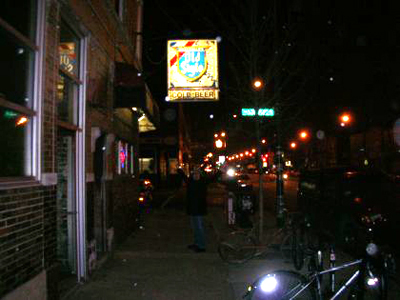 And if that wasn't enough, just next door is Bite Cafe, one of the finest small neighborhood restaurants in this city. Serving breakfast, lunch and dinner (and brunch), with a menu that evolves seasonally and changes specials daily, Bite offers constant delights and surprises at an absurdly affordable cost (I've had meals there better than most found in River North at about a quarter of the price). It's laid back and casual and the perfect compliment to the adjacent rock club. 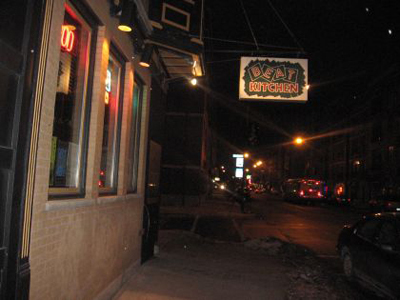 The Beat Kitchen is nestled on perhaps the quaintest stretch of Belmont Avenue. Located on the cusp of Roscoe Village and Hamlin Park, it's surrounded by a menagerie of antique shops, doggy day cares, spas, boutiques and even an upscale catering house--all of which is designed to cater to the growing population of upper-middle class condo residents. It's an odd location for a music club, but stepping inside the Beat Kitchen isn't exactly like traveling to another country. It's pretty quaint in there too. The interior is broken up into two sections. Up front, you have a pretty classic pub/diner with a long mahogany bar, warm earth tones, comfy booths and rows of Christmas lights that adorn the now-standard chic piping. Doubling as a restaurant, the Beat Kitchen serves a full menu of surprisingly good, eclectic cuisine that is offered nightly from Monday through Friday and Saturday and Sunday for brunch. In back is where the music happens, in a long rectangular room that is vaguely reminiscent of an old dance hall and comes complete with shiny floors (for maximum sock sliding effect). Booked exclusively by House Call Entertainment, the Beat Kitchen features a wide variety of local and international independent acts that, according to talent buyer John Benetti, "tend to fall into the following genres: garage rock, punk, indie, alt country, emo, rock and pretty much anything else that we like." To be certain, they're not casting a terribly wide net, but they look for "things that are good, fit with the feel of the room and things that are economically viable. It's greatly based on who is in town, but it is equally dependent on the local scene." You got all that? 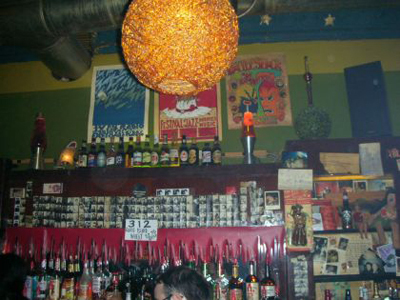 See, the thing about the Beat Kitchen is that it's really charming and friendly and bland. Now I realize that this place probably had a hey-day of sorts well before I came on the scene, but I honestly struggle to find anything that is different and compelling with it currently. The acts booked aren't terribly diverse or really all that good; rarely do I get excited by any of the lineups. And sure, the food is fine, but it's a lesser menu than Bite or even the Harmony Grill. In short, the Beat Kitchen needs to get working to offer music fans something that can't be had anywhere else. Until they do that, they're going to remain near the bottom end of the totem pole. Nicholas Ward produces and writes for 2nd Story, a hybrid performance series that features original storytelling, live music, and a severe degree of wine drinking. In his free time, he waits tables, goes to concerts, and drinks more wine.